Erivum Puliyum: Nurukku Upperi | Kaya Upperi ~ Onam Special !! Hope all my Keralite frenz and readers had a good Onam,Belated Onam wishes to all !! I wasn't well for the past few days and so was away from blogging.Though I had prepared the nurukku upperi much in advance to share it before Onam,but my health didn't permit me to write the post.Anyways,sharing this crispy delicious fries with raw plantain now- a speciality chips of Kerala and a real addictive one too.Kids really love the home fried ones rather than store brought one that we get here in stores.I have posted a recipe of the traditional type of chips too,here.These chips are much similar to that and just differs in the sizes.I have a few more recipes coming soon related to sadya,stay tuned.Hope you all try this sometime and enjoy !!! 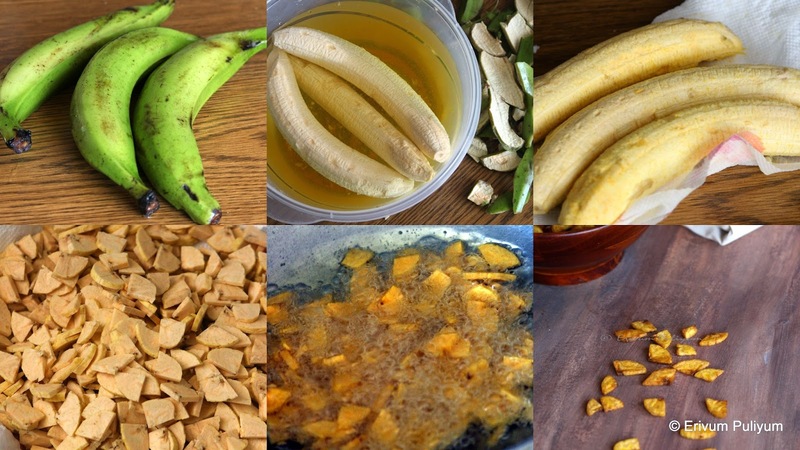 Wash and peel the plantain skin lengthwise to take out the fleshy plantains(apply oil on hands to avoid staining).Keep a wide bowl with water and turmeric powder mixed in it,drop each plantain in it and leave for 20-25 minutes.Drain the water and pat dry the plantains on a paper towel. Cut slits as cross shapes and then cut even rounds to get quarters(the pieces shouldn't be as thick for sharkara varetti nor too thin as upperi).Spread these on a paper towel to soak excess moisture. Heat oil in a wok/kadai till 2 inches deep and the oil shouldn't be smoky hot nor dull,keep on medium flame. Add a slice and check if oil is just correct hot.If the slice pops to the top that means oil is perfectly hot to fry.Fry the cut out plantain quarters in 2 batches on medium heat.Fry them till you start hearing a ringing sound when they rub on each other about 3/4th done. Using a slotted spoon,drain on a paper towel.Total time to fry each batch may be around 15-20 minutes.Repeat the same step for each batch. Enjoy once cooled for tea or sadya or store in air tight containers. * Don't over crowd the wok while frying(fry in batches).Don't heat the oil on very high heat otherwise the inside of the chips may not be cooked. * The slices should be evenly cut so that there is uniform cooking throughout or else somepieces may get easily browned and other takes longer. Crunchy and tasty chips............lovely clicks too! Ooooo ugran theres really something about the chips that makes it difficult to take my hands off the pack.I love the mildly sweet ones too. I can have that bowl in one sitting! Looks very crispy and the presentation is very nice Julie. Hope you have recovered fully. Yeah we had a good celebration. Take care. Wish a huge bottle of this kaya upperi rite now, hard to resist to these deep fried beauties. Belated Onam wishes to you too!!! Hope you feel better. The Upperi looks good. crispy and yummy kaya upperi, very addictive snacks right? Crispy and delicious chips, love the clicks.. These chips bring back my Kerala trip memories. Yours look perfect and chrunchy. Hope you had a lovely Onam too. The Varutha upperi looks perfect!